In this talk, given at the On Guard Conference in 2012, philosopher Dr. William Lane Craig addresses the problem of evil and suffering. It should be noted that the problem of suffering and evil is everybody's problem to deal with and the question that should be asked is, "Which worldview best explains and deals with the problem and reality of suffering and evil?" Further, some have even argued that evil can be counted as evidence for God's existence. c. If you admit one miracle, don't you have to admit them all? This post was originally featured on Apologetics315 here. Thanks to Brian Auten for permission to feature it on Truthbomb. When difficulties, trials, and suffering come in our lives, often the first question we ask is, "why?" How could God allow this? Why does God allow suffering at all? Could there be any purpose in suffering? Joni Eareckson Tada knows hardship firsthand and shares her experiences and reflections on suffering in many of her books. The following is an appendix from her book When God Weeps: Why Our Sufferings Matter to the Almighty. Suffering teaches us humility (2 Cor 12:7). Suffering imparts the mind of Christ (Phil 2:1-11). Suffering teaches us that God is more concerned about character than comfort (Rom 5:3-4; Heb 12:10-11). Suffering teaches us that the greatest good of the Christian life is not absence of pain, but Christlikeness (2 Cor 4:8-10; Rom 8:28-29). Suffering can be a chastisement from God for sin and rebellion (Ps 107:17). Obedience and self-control are from suffering (Heb 5:8; Ps 119:67; Rom 5:1-5;James 1:2-8; Phil 3:10). Voluntary suffering is one way to demonstrate the love of God (2 Cor 8:1-2, 9). Suffering is part of the struggle against sin (Heb 12:4-13). Suffering is part of the struggle against evil men (Ps 27:12; 37:14-15). Suffering is part of the struggle for the kingdom of God (2 Thess 1:5). Suffering is part of the struggle for the gospel (2 Tim 2:8-9). Suffering is part of the struggle against injustice (1 Pet 2:19). Suffering is part of the struggle for the name of Christ (Acts 5:41; 1 Pet 4:14). Suffering indicates how the righteous become sharers in Christ’s suffering (2 Cor 1:5; 1 Pet 4:12-13). Endurance of suffering is given as a cause for reward (2 Cor 4:17; 2 Tim 2:12). Suffering forces community and the administration of the gifts for the common good (Phil 4:12-15). Suffering binds Christians together into a common or joint purpose (Rev 1:9). Suffering produces discernment, knowledge, and teaches us God’s statutes (Ps 119:66-67, 71). Through suffering God is able to obtain our broken and contrite spirit which He desires (Ps 51:16-17). Suffering causes us to discipline our minds by making us focus our hope on the grace to be revealed at the revelation of Jesus Christ (1 Pet 1:6, 13). God uses suffering to humble us so He can exalt us at the proper time (1 Pet 5:6-7). Suffering teaches us to number our days so we can present to God a heart of wisdom (Ps 90:7-12). Suffering is sometimes necessary to win the lost (2 Tim 2:8-10; 4:5-6). Suffering strengthens and allows us to comfort others who are weak (2 Cor 1:3-11). Suffering is small compared to the surpassing value of knowing Christ (Phil 3:8). God desires truth in our innermost being and one way He does it is through suffering (Ps 51:6; 119:17). The equity for suffering will be found in the next life (Ps 58:10-11). Suffering is always coupled with a greater source of grace (2 Tim 1:7-8; 4:16-18). Suffering teaches us to give thanks in times of sorrow (1 Thess 5:17; 2 Cor 1:11). Suffering increases faith (Jer 29:11). Suffering allows God to manifest His care (Ps 56:8). Suffering stretches our hope (Job 13:14-15). Out of His deep love for us God is more interested in making His children like Christ than He is in making us comfortable. The glory He receives from redeeming depraved sinners like us and remaking us into His image will be the song that fills the halls of heaven for all eternity (Rev 5:9-10). Since that will be the case in the future, let us pursue joy in the Lord here in the present. This post is in response to some reader comments offered here. I appreciate everyone’s thoughtful remarks in regard to my post and just wanted to add a few thoughts. First off, I was responding to the amputee question in the manner in which it has been posed to me in the past on more than one occasion. Second, our "Common Objections" series is meant to offer quick and concise answers to popular objections. If one desires a more in-depth answer, they should look to the additional links provided at the end of the original post. what I know about God from these arguments that I am on good grounds for trusting that if God has never healed an amputee, He has morally sufficient reasons for doing so. Please notice that my reasoning here is based upon evidence that I have found convincing upon examination, not in spite of the lack of evidence. 1. If God existed, we would have it on record that he has healed an amputee sometime in human history. 2. We do not have it on record that he healed an amputee sometime in human history. 3. Therefore, it is doubtful God exists. It seems to me that for this argument to be valid (if I have characterized it correctly), one would have to give reasons why God healing an amputee is somehow required for us to conclude He probably exists. However, I don't see how this follows especially when one considers the above reasons that suggests that He does. Finally, I believe these types of arguments that basically say, “If God would do X, I would believe,” are misguided at best because they shift the responsibility back to God to prove Himself to a person. Should we have good reasons to believe the Christian God exists, one should look to the Bible for guidance about how to seek Him instead of demanding that He prove Himself in a manner that pleases their own selfish desires. 1. I have provided links for those who are interested in exploring these arguments more in-depth. 2. I would argue that the resurrection of Christ provides excellent evidence that God has intervened supernaturally in the world and this event is historically testable for the sincere inquirer. Labels: Common Objections, Why Won't God Heal Amputees? The emotional problem of suffering can be very persuasive in leading people to the conclusion that God does not exist or, at the very least, that God stands aloof to the sufferings of mankind and is therefore not worthy of a relationship and worship. Essentially the problem is as follows: How can a good and loving God permit suffering? The person struggling with the emotional problem of suffering more than likely views God as a bad parent. He is not stepping in to stop the suffering of His children. The question I pose in response is this: How can a good and loving human parent permit suffering? Now they may say, "Wait a minute! God is all powerful and human parents are not! Of course they cannot stop their children from suffering!" Yes, this is true. However, there are instances in which human parents have a sufficient reason to allow their children to suffer. My son is nearly two and he is constantly running and climbing in the house and yard. So, naturally and frequently, he falls flat on his face after tripping over his own feet or he bumps his head on a wall or table because he is not paying attention to his surroundings. The majority of the time these instances are minor, so my wife and I do not step in and console his pain by holding him and kissing his boo boos because we want him to be able to learn how to internally handle pain and his emotions. We express our understanding of his pain and encourage and guide him to be careful and to be mindful of his surroundings as he plays. And we do not take this approach stoically. Everything within us wants to scoop him up and console him. I am sure the parents reading this can think of circumstances in which they had allowed, are currently allowing, or plan on allowing a child of their own to suffer for something far more important than relieving temporary pain or discomfort. For example, I am thoroughly prepared to allow my future teenage son who does not make it home by curfew to sleep in the car in order to learn responsibility and respect for me and my wife and our house. In conclusion, if it is reasonable for human parents, with finite knowledge and wisdom, to allow their children to suffer for a greater purpose; why is it not for God who has infinite knowledge and wisdom? For more resources dealing with Jehovah's Witnesses, checkout our Apologetics Arsenal located here. Jim Wallace's story is unique. He is a cold-case homicide detective and a former atheist. Wallace argues for the truth of Christianity using the methods of a detective and stories from actual cases he has worked. In this video, Jim makes the case for the reliability of the scripture and deals with many possible objections. This talk is a great overview of Jim's new book. Greg Koukl on "Unbelievable Belief"
You can learn more about Charlie Campbell's ministry here. Common Objection #19- "Why Won't God Heal Amputees? Pt.1"
1. This objection assumes that God has never healed an amputee. However, how can one know that God has never healed any amputee ever in human history? 2. It is possible that God has morally sufficient reasons for not healing amputees. Since this is at the very least possible, this objection fails. "God maintains a delicate balance between keeping his existence sufficiently evident so people will know He's there and yet hiding His presence enough so that people who want to choose to ignore Him can do it. This way, their choice of destiny is really free." For more on this, please see Pt. 2 of this post entitled "Why Won't God Heal Amputees" Revisited. 3. Even if God has never healed an amputee at any moment in human history it still does not follow that He doesn't exist. One still must deal with the positive evidence that suggests God does exist. 4. I believe the person making this objection is operating under a false assumption. Let us imagine that an amputee prays to be healed and wakes up the next morning with their once missing limb fully in tact. I could easily imagine those who would still search for a naturalistic explanation for how the limb returned in spite of the evidence that a miracle had occurred. This objection assumes that the problem is intellectual. However, it could be that the objector is suppressing the truth simply because they do not want to be accountable to God. In other words, it could be that their problem with God is not an intellectual one, but a moral one. You can read in-depth replies to this common objection here, here, here or see our follow-up post here. Checkout our other responses to common objections here. Labels: articles, Common Objections, Why Won't God Heal Amputees? 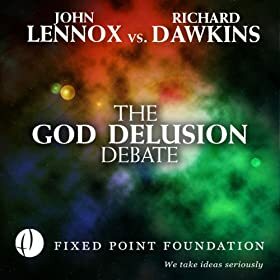 Debate Video: Richard Dawkins vs. John Lennox- "The God Delusion Debate"
Many thanks to those who came out tonight to watch "The God Delusion Debate" between Richard Dawkins and John Lennox. Moreover, thank you for the lively discussion afterward! Greg Koukl of Stand to Reason debates Prof. John Baker, a philosophy professor from the University of Calgary, on the topic of "Do Moral Truths Exist?" In 2006, "Darwin's Rottweiler" Richard Dawkins debated theologian and mathematician John Lennox. We will be viewing this debate Friday, April 19th at Faith Christian Fellowship in Williamsport, MD from 7 to 9:30 pm. Admittance is free and their will be a Q and A immediately following the debate. This article provides an introduction to the Baha'i religion and how it compares to Christianity. If you want to dig deeper, links to further articles are given at the very bottom of the page. Sye Ten Bruggencate, at his website Proof that God Exists, utilizes pre-suppositional apologetics in a very clever way. What to see Sye's proof that God exists? Go here. For those not familiar with this approach, his site is a great introduction! There is great value in being familiar with the various approaches to apologetics. I believe each have something of value to offer! A few months ago we had the pleasure of reviewing J. Warner Wallace's excellent book Cold-Case Christianity. For those interested, you can see that review here. If you haven't read this book yet, we highly recommend that you do! If you are interested in becoming a persuasive Christian case maker, Wallace's book and website are great places to start! In this featured article, Sam Dallas of Solid Reasons presents a positive case for the resurrection of Jesus of Nazareth. 2. Jesus' disciples believed that he rose and appeared to them. 4. The skeptic of James, the brother of Jesus, was suddenly changed. For those interested, Dallas also deals with some of the popular objections to Jesus' resurrection here. 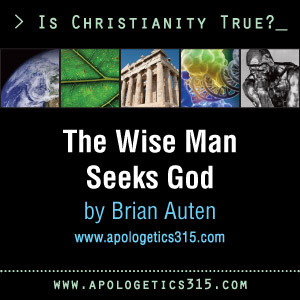 This featured essay is by apologist Brian Auten of Apologetics315. In the essay, Auten explains why the unbeliever, in a universe where God could exist, would be wise to search for God. "The purpose of this essay is to show that, given the data that is before us, in the absence of certainty that God does not exist, it is the wise man that will seek God. Furthermore, this essay will argue that one should seek the Christian God, for, if the Christian God truly exists, He can be found by those who seek Him on His terms." I highly recommend this essay and you can find it here. This essay was a part of Apologetics315's Is Christianity True? project which can be found here. Failing to Read the Bible Related to Declining Morals in US Society? The Bible continues to dominate both mind space and book retail space as America’s undisputed best-seller. One in six people reported buying a copy of the Bible in the last year. 80 percent of Americans identify the Bible as sacred. Americans have plenty of copies at their fingertips—an average of 4.4 Bibles per household. 56 percent of adults believe the Bible should have a greater role in U.S. society. Actual Bible reading and perceptions about the Bible have become increasingly polarized, with 6 million new Bible antagonists in the last year alone. More than half (57 percent) of those ages 18-28 report reading the Bible less than three times a year or never. In a non-election year, an increasing number of adults believe the Bible and politics do not mix (54 percent, compared to 49 percent in 2012). However, 69 percent still say their faith influences their views on political issues. Full findings and infographic of study highlights are available at TheStateoftheBible.com.